The AmEx-sponsored concert is streaming live via Facebook tonight. Kendrick Lamar is performing at a sold-out, free show tonight at the Music Hall of Williamsburg, which is being streamed live via Facebook tonight. The show, which is sponsored by American Express, was announced yesterday, and naturally, it sold out pretty much immediately. 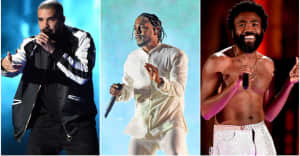 The "secret show" comes as part of an ongoing partnership between Kendrick and AmEx, following on the heels of a team-up commercial with Shaq. The livestream should start at 6pm over on Kendrick's page. Watch here.